Thank the northern knack for turning humble ingredients into something sublime for this crustacean-flavoured soup. It’s made from paddy crabs, packed with tomato chunks, green onions and bun (rice vermicelli), and capped with a floater of sautéed crab fat. One of the tastiest relics of Emperor Tu Duc’s reign is banh, steamed rice cakes eaten with a drizzle of fish sauce. Whether eaten plain, dotted with chopped mushrooms, or stuffed with chopped dried shrimp, these dainty Hué bites make the perfect light breakfast or between-meal snack. 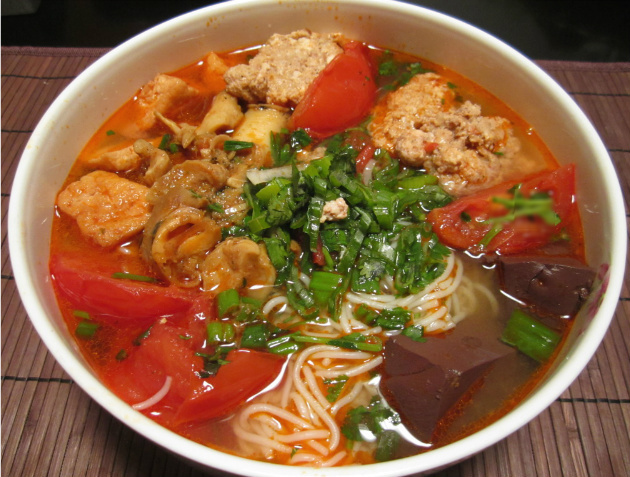 Heatloving central Vietnamese often add a dollop of chilli sauce. Thick and chewy turmeric-yellow noodles are topped with shrimp, pork, bean sprouts, herbs and chopped peanuts, and are moistened with just a bit of rich broth. Named for its native province of Quang Nam, the dish comes with rice crackers for crumbling and is finished in characteristically central- Vietnamese style, with a dab of sweet-hot chilli jam.